The wooden bar survived a fire at Tip Top Billiard Parlor, a Downtown establishment that Manuel’s father, Gibran, ran for three decades. The stools have been in use since Manuel created a pub out of the former Harry’s Delicatessen, a beer-and-sandwich joint that occupied the center storefront. He salvaged the paneling behind the booths from homes slated for demolition. “We have to repair the upholstery, but everything else is the same it was when the main bar opened,” Brian says. 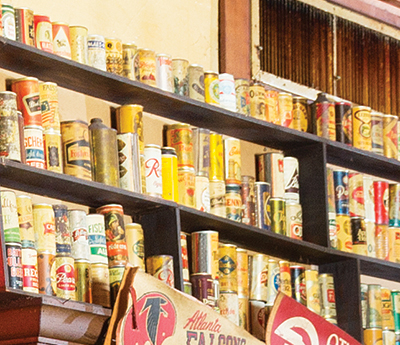 Many of the 200-plus cans were souvenirs, brought by vacationing regulars. “People want to leave us their collections,” Brian says. 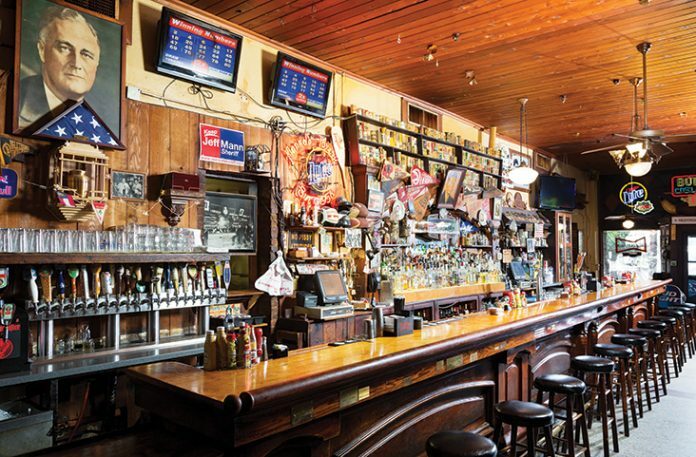 “But I just don’t have room.” Until the 1970s, the tavern served beer only; even today, brews account for triple the sales of liquor and wine. After Manuel’s death, his ashes were placed behind the bar below a portrait of FDR. In 2013, they were joined by the ashes of his younger brother, Robert, who managed the tavern’s daily operations during Manuel’s political career. A third urn contains the cremains of longtime patron Calvin Fluellen, the first African American graduate of the Grady Memorial College of Radiology. A protective frame encloses Fluellen’s urn: “We knew that there would be a night when his friends would beg, ‘Oh, take Calvin down and let him join us at the bar,’” Brian says. Other patrons are memorialized: A glass case holds books by author Paul Hemphill. 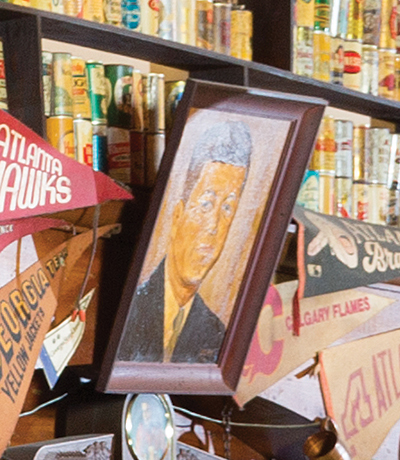 When the Falcons came to town in 1966, Manuel was an early supporter, buying blocks of season tickets and chartering buses to games. The Atlanta Flames hockey franchise is, of course, long gone. The newest pennant is for Georgia State, which fielded its inaugural football team in 2010. Manuel met his wife, Dorothy, better known as Dolly, when he was a World War II Air Corps mechanic stationed in England. He modeled the tavern after British pubs. Their son Michael was the oldest of eight children. “People ask, ‘How do I get my name on a plate?,’ and I tell them, ‘You don’t want to,’” Brian says. 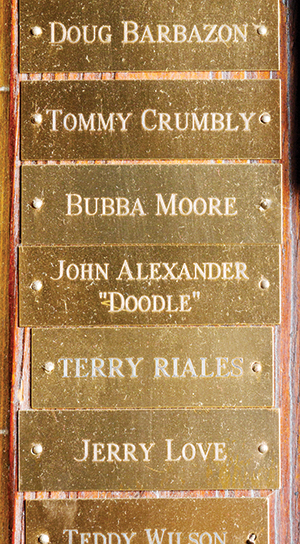 The brass nameplates honor deceased regulars and are mounted near particular stools or booths. Plates near the door honor those barflies who flitted from seat to seat. 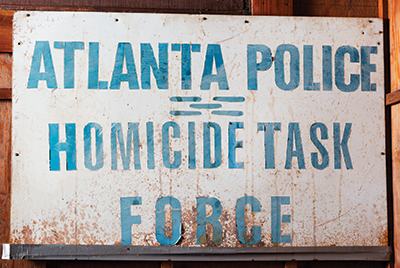 One nameplate honors Ken Raines, a detective assigned to the Atlanta Missing and Murdered Children cases in the 1980s. The special unit was stationed around the corner from the bar. 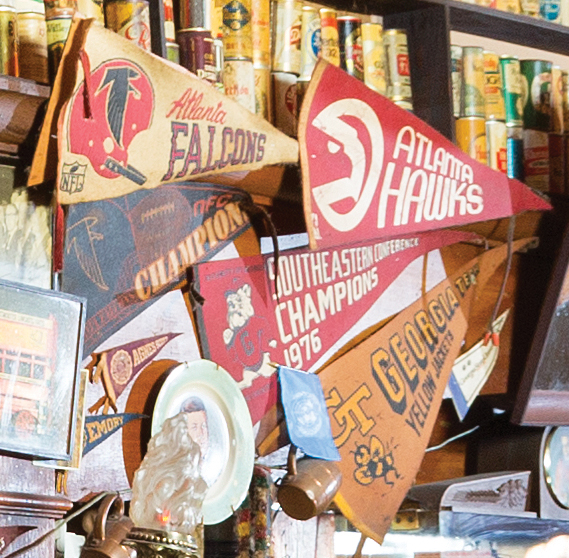 On the day the team was relocated, Raines carried the sign over to Manuel’s. Only six zones make up the APD, but cops used “Zone 7” as code to arrange to meet at Manuel’s; a sign reading “APD Zone 7” hangs in one room. Legend has it that APD Chief Eldrin Bell once came for lunch, spotted multiple squad cars in the parking lot, and made it a policy that no more than a handful of cops could be seen in the bar at any time. 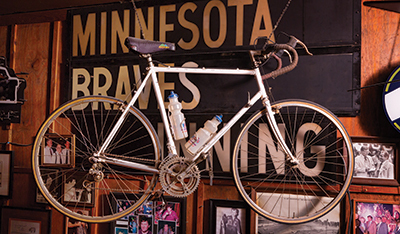 The bar remains a required stop for local and national Democratic candidates. Jimmy Carter announced his 1970 gubernatorial bid at Manuel’s, and his grandson Jason, presently running for governor, has been spotted there. 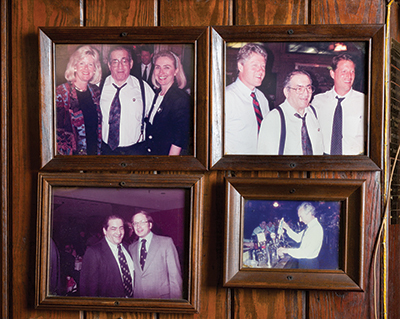 Above, the Clinton–Gores in 1992; below, Senator Wyche Fowler works the beer taps, and Manuel poses with Senator Sam Nunn, whose daughter Michelle, currently campaigning for the U.S. Senate, spent hours at Manuel’s while launching Hands On Atlanta. One hot summer day a few years ago, Reverend Monsignor R. Donald Kiernan came for lunch and brought along Archbishop John F. Donoghue. 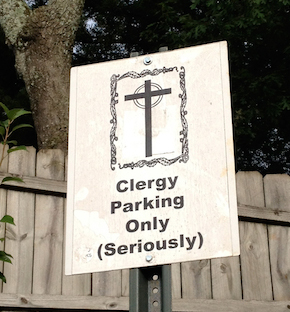 The elderly clergymen were forced to park on at the far end of the lot. By the time they reached the tavern, they were overheated in their black vestments. “He told me, ‘If I have to walk like this, I won’t be able to come back,’ and I swore to him he never would,” Maloof says. The clergy-only spots were installed within days. Generally, the rule is followed, though, sometimes the staff spots a Bible tossed onto the dashboard as a makeshift parking credential. 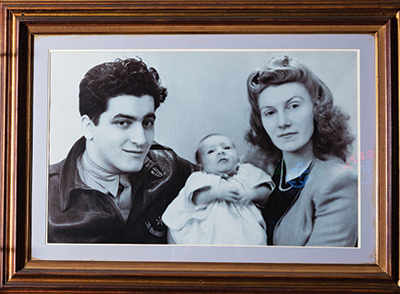 When the Maloof family moved to Atlanta after emigrating from Lebanon, they were an anomaly—Arab-speaking Catholics. The family co-founded St. John Chrysostom Melkite church on Ponce de Leon Avenue; its namesake saint was born in Syria. As of this year, Maloof operates a state-certified, twenty-four-hen chicken coop on the rooftop of the bar. You can sample the organic eggs at weekend brunch. Click here to learn more about the “roof-to-table” coop. This article originally appeared in our August 2014 issue.